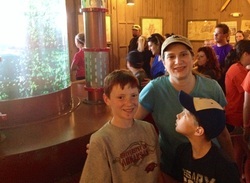 Over the past few weekends, my husband and I, along with our two boys, have spent a lot of time at Silver Dollar City. We've had a great time riding roller coasters, watching different craftsmen, enjoying shows, and certainly eating more than our fair share of food. If I had to pick one thing I enjoyed the most (other than simply being with my family) it would have to be the big coasters. We all love the breath-taking drops, sharp turns, and upside down barrel rows. What makes this remarkable? Really, it is because in our family and so with so many other ostomates, it is just another fun adventure with those we love. Yes, I do have an ostomy but it doesn't stop "my living". For me, my ostomy has meant that I can "do more living" instead of being constantly sick or in pain. Do I still feel bad more than the average person? Sure. Do I have more aches and pains then some? Probably. Do I have as much fun and does my life have as much meaning than other people? Absolutely! My ostomy means that I get to be a more engaged mom to my boys, have a career, help others, and enjoy time with my family and friends. My ostomy doesn't define who I am. To be fair, however, it wasn't an overnight experience. It is a journey. A number of years ago, I was given a permanent ostomy at the Mayo Clinic. Even though I had already experience life with a temporary ostomy 5 years before, I remember preparing for the trip back to Arkansas. I was nervous about going to the restroom in public. I could feel the butterflies in my stomach as we pulled up into the Arby's parking lot. Of course, everything was fine. There have been many times where I have been a little nervous about something. How do I deal with it? It is the same way we deal with anxiety in the rest of our lives. Little by little we push ourselves to do something that is a tad out of our comfort zone. When we realize that many of our fears either don't happen or when they do, we can handle them, our confidence grows. I have over 15 years of living with an ostomy. I have had many opportunities to "grow in confidence" but it started with one experience at a time. For me, I don't live life in spite of my ostomy, but in part because of it. In so many ways, my experience as an ostomate has shape me into the person I am today. You might not be able to ride the coasters at Silver Dollar City but you can join me on an adventure. Try taking one small step out of your comfort zone. Just like on a coaster, be sure to put the safety bar down, secure any lose items, hold your breath, and see what adventure lies ahead! Living with a stoma, creates some degree of anxiety for most people. Traveling away from home compounds that anxiety. The security of knowing where you are, where there is an acceptable bathroom, that clinicians are available if there is a real problem, and the simple security of knowing you can run home to change appliances and, if necessary clothing....well, all of that is gone with travel. Remember back when you came home with a brand new ostomy, did you have any real sense of security? You, like most, felt insecure in every setting and expected the worst case scenerio to befall you. The reality is that accidents can happen but the reality is that they seldom happen. As you gained more and more experience with more and more new adventures without a problem, your confidence has grown. In part, your confidence has grown because of your experience and in part, because of your knowledge that you can handle an emergency. You have developed plans and contingencies to manage any crisis. in your wallet. What you should expect is not that you get a “free pass” through security but that the TSA agent will be informed and respectful of you. I recommend going through security with a recently emptied pouch. This may not even trigger any further screening than that the standardized xray. If more is needed, you should inform the TSA agent that you have an ostomy and share the TSA card with him/her. They will ask you to run your hand over your pouch and then will test your hand for explosives. (They are interested in a different kind of explosives than what you normally have in your pouch!) In addition to emptying your pouch before going through security, always empty before boarding. If you need to empty in-flight, the restrooms on board will work just as well as the one at home. Additional options are available that some that do not apply to everyone. Patients with a urostomy may opt for a leg bag. If so, the same suggestions hold true for keeping both pouches emptied. Other patients may want to add an extra gas filter for odor control and maintaining a flat pouch. The filter is NOT needed for airline travel since all cabins are pressurized. Coloplast, and Convatec websites for additional information.